Here's a sneak peak into my new collection for October... It's called RAINBOW DROPS. The collection features a series of earrings made from acrylic flower beads with Swarovski pearls available in black, clear and rainbow colors. Watch out for the necklaces in the next feature. Missed featuring it in the last newsletter as I was waiting for the full set of supplies to arrival.. Nevertheless, here they are.. Hope you'll love them..
Ps : The results from my Newsletter (see Mailchimp) was ENCOURAGING! About 2/5 of recipients opened the newsletter. However I got 2 SALES from my previous customers which was great 'cos it implies that they have read the newsletter and purchase from me again! Ok... back to the new collection. Cute and colorful! I like it! 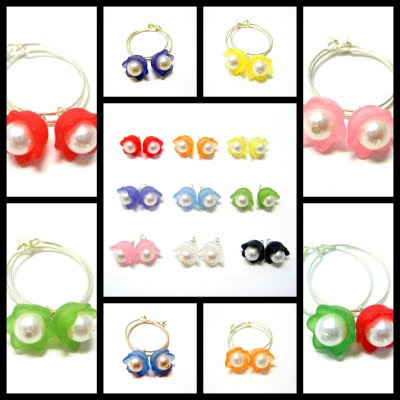 Cute earrings and there's a pair to match every color! Very cute! Love the name!